Structured credit products are one of today's fastest growing investment and risk management mechanisms, and a focus of innovation and creativity in the capital markets. The building blocks of these products are credit derivatives, which are among the most widely used products in finance. This book offers a succinct and focused description of the main credit derivative instruments, as well as the more complex products such as synthetic collateralized debt obligations. This new edition features updated case studies from Europe and Asia, the latest developments in synthetic structures, the impact of the subprime meltdown, along with models and teaching aids. Moorad Choudhry returns with this excellent update of the credit derivatives market. The second edition of his classic work is, like the subject matter itself, at the forefront of the financial industry. It deserves a wide readership. This is the perfect companion for both experienced and entry level professionals working in the structured credit fraternity. It is an erudite, insightful and enjoyable read that successfully demystifies one of the most topical subject areas in banking today, while also providing important practical examples that link the theory to the job itself. 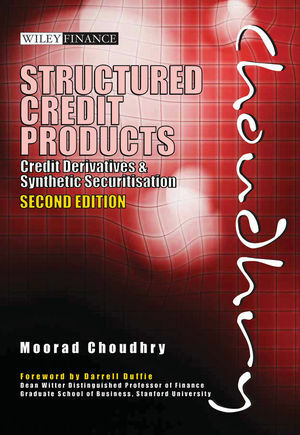 Moorad Choudhry has earned a deserved reputation from both academics and practitioners as one of the leading practical yet rigorous authors of finance books. In this Second Edition, his practical knowledge of credit derivatives keeps the audience engaged with straightforward explanations of complicated structures, and an accessible level of mathematical sophistication necessary to understand structured credit products. The author offers complete, rigorous analysis while avoiding overuse of mathematical formulas and carefully balanced practical and theoretical aspects of the subject. I strongly recommend this book for those wishing to gain an intuitive understanding of structured credit products, from practitioners to students of finance! This is THE book for credit derivative trading. From first steps to advanced trading strategies, this is invaluable. Well written and insightful, perfect for ad hoc reference or reading cover to cover. Professor Choudhry has inspired me to really get into credit derivatives. It’s great to be lectured by someone with such energy and practical hands-on experience, as well as the ability to get stuck into the details. Moorad Choudhry is Head of Treasury at Europe Arab Bank plc in London. He is a Visiting Professor at the Department of Economics at London Metropolitan University. Moorad Choudhry is Head of Treasury at Europe Arab Bank plc in London, and Visiting Professor at the Department of Economics, London Metropolitan University. Foreword (Professor Darrell Duffie, Stanford University). Prologue: The 2007–2008 credit and liquidity crunch: Impact on structured credit markets. PART I: Credit risk and credit derivative instruments. CHAPTER 2: Credit derivatives I: Unfunded instruments. CHAPTER 3: Credit derivatives II: Funded instruments. CHAPTER 4: Credit analysis and relative value measurement. CHAPTER 5: Credit derivatives III: Applications. CHAPTER 6: Credit derivatives pricing and valuation. CHAPTER 7: Credit default swap pricing. CHAPTER 8: The asset swap—credit default swap basis I: The asset swap pricing of credit default swaps. CHAPTER 9: The credit default swap basis II: Analysing the relationship between cash and synthetic markets. CHAPTER 10: Trading the credit default swap basis: Illustrating positive and negative basis arbitrage trades. CHAPTER 11: Syndicated loans, loan-only credit default swaps and CDS legal documentation. PART II: Structured credit products and synthetic securitisation. CHAPTER 12: An introduction to securitisation. CHAPTER 13: Synthetic collateralised debt obligations. CHAPTER 14: CDO valuation and cash flow waterfall models. CHAPTER 15: Synthetic conduits and credit derivative funding structures. CHAPTER 16: Files on the accompanying CD-R.
Afterword: Econometrics, finance and football . . . .